¡Hola! 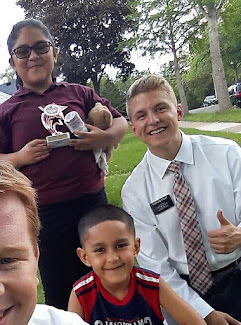 So our companionship situation has been a bit confusing, but apparently we were supposed to be in a quad companionship for a day, with Elder Fuentes and Elder Brunsdale, so that, when Elder Fuentes left, Elder Brunsdale would be put into a trio with us and he wouldn’t be left without a companion. So we are in another trio today. Haha! This elder is really awesome, and super tall and athletic! Basically we have another mini P-day today because we are leaving tomorrow (we got one yesterday because Elder Fuentes was leaving) so the schedule has been a bit strange. We just make our own schedule basically and join random classes for language study and stuff. But it’s been really nice. I won’t type out another full update, but just another short email to you guys. I´m also going to send you some left over pics that I have from last week. So my flight leaves at 6 am, but due to time changes I will be in Dallas around 7:30 to 8 am and then catch a flight to Minneapolis around 10 am. We have had a lot of free time since we don’t have a definite schedule today and yesterday so I have been studying a ton of vocab and also reading the scriptures a lot. So that´s been really nice! I have started to love scriptures in Isaiah and also the Isaiah chapters in Nephi. So I have been reading my patriarchal blessing a lot more and I found something that is really awesome to help study the scriptures.. I pick an adjective or trait in my patriarchal blessing and look up scriptures on that topic. And recently I have had many instances when I look for scriptures and end up in Isaiah and I read the surrounding scriptures and they are just filled with gold! I need to write some awesome scriptures down that I found to share with you. But one that I found this morning relates to the devotional given by Elder Dale G. Renlund that I talked about in my update. 1 Nephi 21: 13-16 was really cool to read. I especially like verse 16 when it says he has graven us upon his palms. Kind of like Elder Renlund said, he bares our scars, he knows our pains, and he has a perfect love for us! I love you guys and thank you all for your amazing examples!